The first long weekend after the onset of Spring is during the second weekend of May with the third Monday of May celebrated as Victoria Day. Queen Victoria was Canada’s sovereign at the time of Confederation in 1867. When Queen Victoria died in 1901, Parliament made her birthday an annual holiday to be celebrated on May 24. In 1952, the Parliament ruled that the Monday before May 24 be celebrated as Victoria Day. The weekend is known in Canada as the unofficial start of summer and is the oldest state holiday. Gardening enthusiasts like us make use of the long weekend to begin planting annual saplings in the gardens. It was a family affair as usual with Marina and children, all joining and helping to plan and layout a garden which would be treat to everyone’s eyes. We brought many plants from the local nursery, and some saplings we had grown indoors, to go with the new colour scheme we had decided. Two weeks prior we had visited the city’s recycling yard to collect compost to feed the garden as we have been practising organic farming. We finished with planting our garden early by Saturday afternoon, and hence decided to drive to Tobermory, about 300 km North of Toronto to enjoy the rest of the long weekend. Tobermory derives its name from Scottish dialect where in ‘Tobar Mhoire’ means the ‘well of Mary’. The name was given by Scottish fishermen after the port of Tobermory on the Island of Mull in Scotland. We reached Tobermoryby 7 PM and checked into a motel there. Tobermory is known as the Scuba Diving Capital of Canada and is located at the mouth of Big Tub Harbour on the Georgian Bay of Lake Huron. The area comes under Fathom Five Park, Canada’s first National Marine Park. The park is known for over 20 shipwrecks and 19 islands, notably Flowerpot Island, within its boundaries. 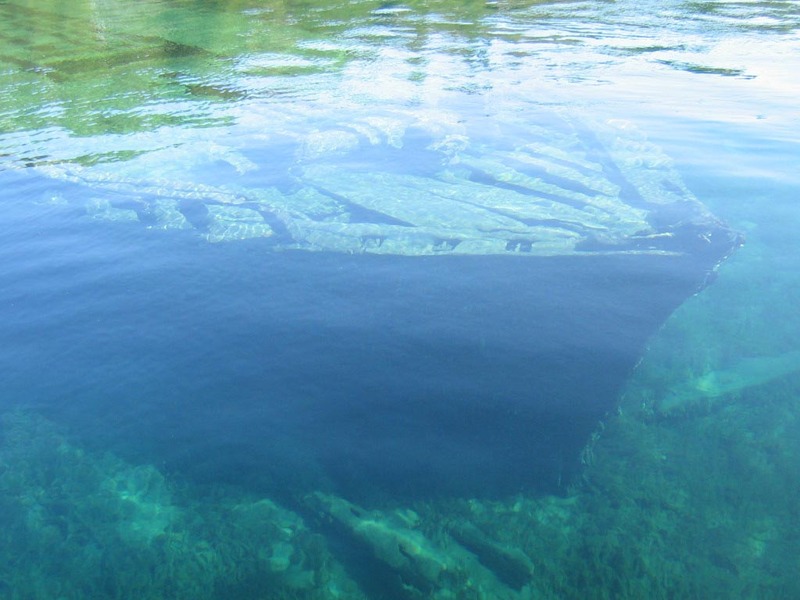 Only two shipwrecks in the harbour are intact and visible from the water surface. 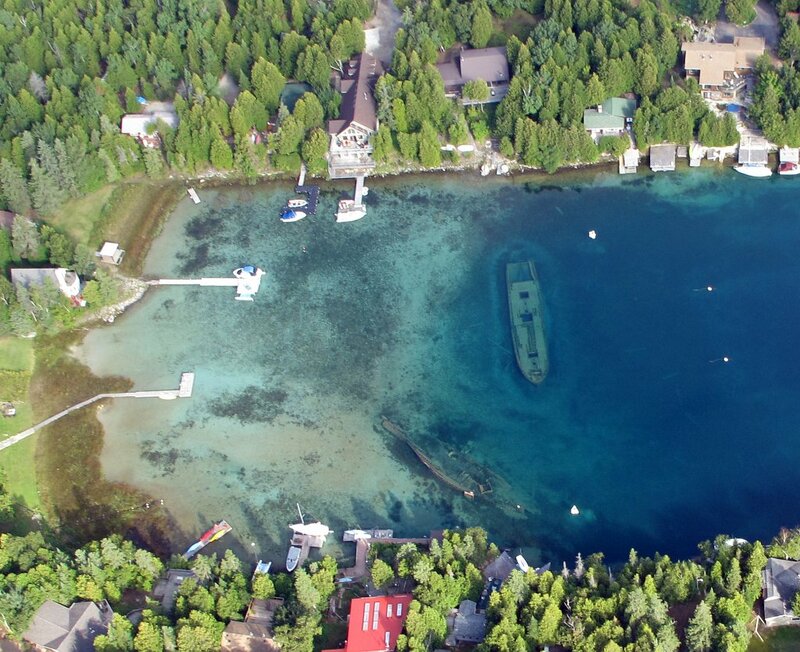 The other wrecks are disintegrated and dispersed around on the lake bed in the Georgian Bay. The deep clear water and the numerous shipwrecks attract over 8,000 divers from around the world each year. 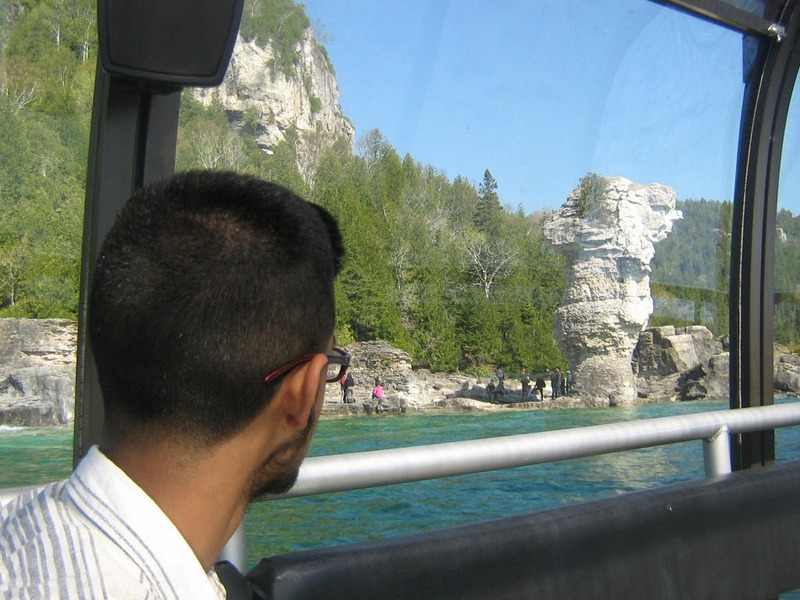 We booked for a boat cruise for Sunday morning to explore the Fathom Five Marine Park. We set off on the boat with about 30 other tourists. The boat’s guide briefed everyone about the safety drills and then we took off to the Big Tub Harbour. 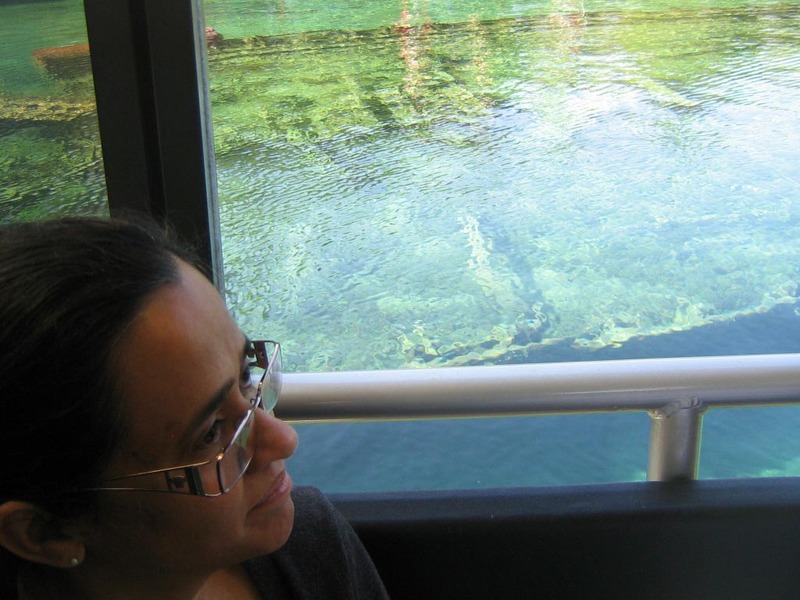 The boat had a glass bottom and we could see the lake’s bed clearly. The algae and lichens in the cold water and the lime stones in the lake bed ensures that the water remains crystal clear all through the year. Our first stop was atop the wreckage of The Sweepstakes, a Great Lakes Ship Built in 1867 in Burlington, Ontario. The wreckage is at a depth of about 20 feet. This double masted, 120 feet long ship was damaged while hauling coal late in the summer of 1885 and then towed to Big Tub Harbour to be repaired. In September of 1885 it was determined that the damage was too extensive to be repaired. She was stripped of anything of value before sinking where she lies today. Her hull is still intact and is considered one of the best preserved nineteenth century great lakes ships to ever be discovered. In order to reinforce the hull and reduce further deterioration, metal bars throughout the inside of her hull have been installed by Parks Canada. The next halt was 100 meters away at the wreckage site of a passenger ship – The City of Grand Rapids. She was an elegant a double-decked passenger steamer until it burned and sank in October, 1907. Its charred remains now lie in shallow water about 15 ft deep. On the evening of October 29, 1907, fire broke out aboard the Grand Rapids while docked in the Little Tub Harbour. A tug towed the burning ship out of the harbour, and released it. The City of Grand Rapids then drifted into Big Tub Harbor. It continued to burn, and eventually came to rest at the head of the harbour, where it burned to the waterline, rolled to starboard and sank. Today, the iron-sheathed hull is intact and is filled with coal used for the boilers, as well as silt. The charred tips of the frames can be seen on both the starboard and port sides. Lying on the bottom and clearly visible mid-way along the starboard side is part of the smoke stack and a metal frame from the piano that once entertained the guests on board. Our next stop was at the Big Tub Lighthouse. In 1871 Captain John Charles Earl settled at The Big Tub Harbour. In those days, vessels were extensively used to transport coal, lumber, fur, blubber etc as part of the trade through the Great Lakes. The perfect safety with which vessels could lie in the basin at Tobermory had made this harbour much frequented harbour of refuge. 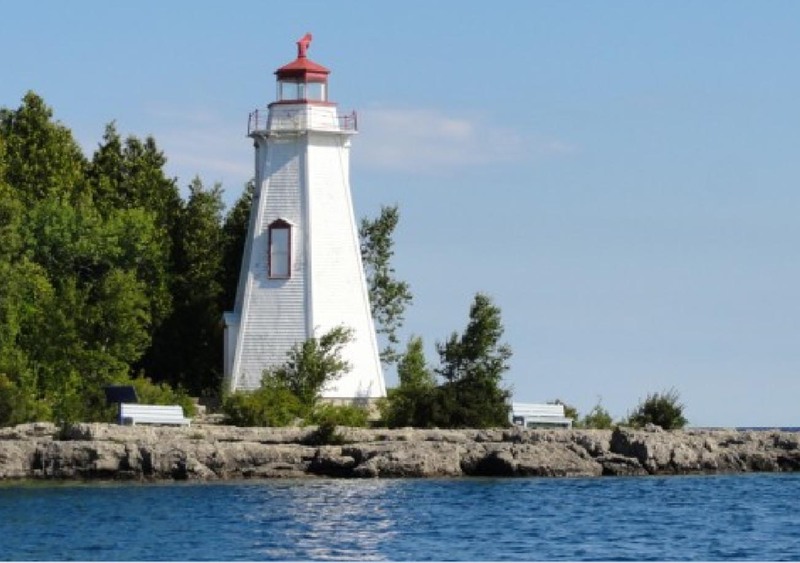 For the convenience of navigators, Captain Earl started hanging a lantern at the top of a high pole to ensure safe navigation for vessels entering the harbor from the treacherous waters of Lake Huron and Georgian Bay. The number of shipwrecks offshore testify to the dangerous waters of this area. He was remunerated for this service by various captains, they presenting him with useful house supplies, such as a bag of potatoes, flour, etc. In the course of a few years the Government acknowledged this service and paid him a salary of about $30 a year. The first lighthouse was constructed in 1885 for a cost of $675. The original structure was later replaced by the six-sided, 14 meter high wooden lighthouse of today. The lighthouse, a fully automated one today, still guides boats through powerful currents, frequent fogs and numerous shoals to the safety of Big Tub Harbour. From the lighthouse, the boat sped away, skimming the waters to reach the Flowerpot Island, one of Canada’s most fascinating natural attractions, about 6 km away. This is the only island in the park which has camping facilities, marked trails, caves and its namesake flowerpots. The Flowerpots are a type of sea stack, formed over many years as wind, rain, waves and ice hammered away at the cliff that once stood alongside the water’s edge. The softer rock eroded more quickly, leaving the harder rock remaining in the shape of Flowerpots. There are many flowerpots all along the waters on the Island. The caves on the island were formed after the ice age, approximately 12,000 years ago, when the glacial Lake Algonquin completely covered Flowerpot Island. As the lake levels fell in stages, the cliffs were exposed to the eroding effects of the lake for varying durations of time. This phenomenon caused numerous caves to form in the cliffs throughout the island. After a well deserved break, we returned home by evening on Sunday, to tend to the saplings we planted and for the summer months to arrive. Awesome, Hatts of to you uncle . Good one. Do you have some pictures? Great Talking to you after a Long time. Beautiful Write up about a Fascinating Place. Your piece about SS.Amravathi Nagar was very Nostalgic. I could vividly recollect the Stories told to me by S.Rajan Babu(My Mentor/God Father @ Juliet Sqn) Balaji,Ramki,Vedha. Dear Reji, excellent graphical description. Feels like have been there. The water seems to very clear like our wells in kerala. It brings back memories of the unpolluted water bodies of childhood. wowww Reji uncle…. Thanks for the write up. Zubin and I sure look forward to visiting the wrecks and the lighthouse.